Our job is to inform the FIFA 19 community. It would be a big mistake not to talk about the so-called In-Game Ratings. These numbers are constantly being broadcasted as a secret formula to success, because… are they really true after all? Are you accustomed to seeing a bunch of colourful images being published by all the FUT databases with a player and a rating for each position of the pitch? Are you? Well, of course you are, just look at these IG ratings we got for Neymar by looking at three different websites. If you don’t know what this is, basically it’s numbers that say how well a determined player performs in each position. At least it’s what most of the community thinks. They’re normally known as ‘In-Game Ratings’, but are also called ‘Ratings per Position’, ‘Best Positions’ or even ‘True Ratings’ (what a fancy name!) on other websites. Before anything else, it’s important to mention that we have nothing against databases. They provide a very useful type of service that surely enhances the community’s game experience. However, people who keep up with this game mode daily, like ourselves, are able to notice when something isn’t quite right. Every time someone comes up with an innovation, everyone else will go ahead and copy that. If you eventually run into a website with several new ideas, in just a few days they will all be absorbed by the bigger websites. And this is valid both for good things (cards’ prices, IG player statistics, etc) and bad things. It happened with chemistry when all websites decided to mistakenly copy the attribute bonuses according to styles, and it happened when everyone adopted a stupid idea that was named after In-Game Ratings, which we’re here now trying to bring down. We’ve explained to some of these websites how these numbers make no sense and, generally, the answer we got was that they weren’t willing to take this (dis)information down because, although they recognise we’re correct, it’s something the community searches often so they don’t want to lose audience, plus some other websites would always maintain the data accessible anyway. Remember how we said in our player ratings guide that the player’s rating depends on the position he plays for the weighted average of attributes is calculated in a certain way for each position? Well then, this is what In-Game Ratings are. They took Neymar (not literally, of course! ), did the weighted average of attributes for each possible and imaginary position and then published the results. Seems flawless, doesn’t it? For us this is either acting in bad faith or, perhaps, many of the famous Youtubers out there have really just been showing some major lack of FIFA knowledge. We’ll explain why. Let’s imagine you’re a regular FUT player. Not that difficult, right? Someone told you that it’s possible to know how well any player can play outside of his original position, so you go to one of these database websites to find out whether this is true or not. You pick Neymar, open the page of his NIF card and concluded that, after all, once you have enough coins to buy him (which is probably going to be by the time the next FIFA is out) you might as well use him as a CAM because he actually performs as well on that position as he does as a left winger (his actual position). You realise that was quite an amazing discovery, pretty undebatable, after all the numbers don’t lie. Instead of settling with that conclusion, do try to keep up with us here. Start by going to some different databases and do the same search. Do the different results confuse you? That’s fine, it’s because the way calculations were made are different from one website to another. That’s why if you decided to use him as a centre back (why the hell would someone do that anyway? ), you’d get IG ratings varying from 47 to 48 (International Reputation is not taken into account in these websites). 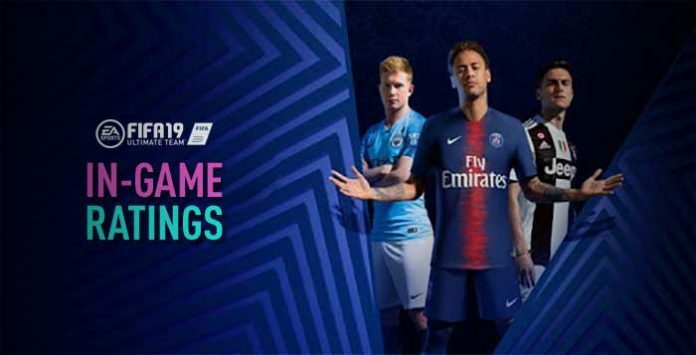 If even after reading this article you insist on comparing players by their True Ratings (we can’t resist the urge to use this name: it’s just so sweet! ), then you’re probably challenging us. How can you claim a determined number is good or bad if, as we’ve seen on our player ratings guide (yes, you need to read it! ), a rating is just as or even more subjective than EA’s Team of the Week selection? You may argue that at least you’re able to compare two players in the same position because you’re putting their most relevant attributes side-to-side, but don’t forget that the players aren’t set to just stay fixed at one position. They move to different zones of the pitch during the game, performing roles that might be a characteristic of another position. Besides, the weighted average of attributes doesn’t take a lot of things into account. A determined player may have a superior IG rating than another player but, for example, he may be shorter, have no stars of skill and/or weak foot. Conclusion: the ratings, In-Game ratings in particular, are good for nothing. If you’re a stubborn person, you may still think Neymar can play as an excellent CAM. He might as well do that, but IG rating can’t really confirm anything. Do you really think he’ll perform a centre midfielder role better than a left-wing role? If your answer is yes, don’t take this personally but you still have a poor perception of how Ultimate Team works. These magical numbers many websites claim to be the formula to success are no more than lies. The average player is going to look at them and be satisfied with the chance of new opportunities and open doors. When someone has this type of realisation, their brain tends to appreciate the discovery and disregard logical thinking. We’re happy with something and we don’t want it to go away. In this case here, people keep visiting these websites and making decisions based on them. On the other hand, the database administrators themselves, even though they know they’re not providing correct information, they’d rather correspond to the demand so they keep it all online. Do you see how the circle closes? Do you still not realise why we’re saying these numbers have no apparent meaning, even after we’ve explained how subjective ratings are? Perhaps here’s the strongest reason of all: chemistry. So you went ahead and put the Brazilian winger as a CAM after all. With this, you’re expecting him to play as a 90 rated player (not counting IR), whatever that means. It’s just that this isn’t how things work in Ultimate Team. If he’s playing outside of his original card position, his capacities are penalised. In the case of an LW playing as a CAM, and as you can see here, this attribute decrease will be so harsh that Neymar will surely not play as well as in his original position. Optimistically, he’d have individual chemistry of 4, meaning he’d lose at least 4 points of overall rating. Okay, this time you’re right: we’re talking about rating variations when they don’t represent anything. It was just so we could give you an idea, which is also what EA had in mind when creating them. The point here is that someone who looks at In-Game ratings creates expectations that will never be fulfilled because these numbers do not contemplate the strong attribute penalisation chemistry applies to players out of position. Rodrigo, então você sugere que não façamos uso das táticas personalizadas pra mudar formação?? Eu costumo montar o time na 4-5-1, e dai usando as táticas, mudo pra 4-2-3-1, e meu LM e RM viram CAM. As vezes quem eu coloco de VOL, vira ATA, e o ATA vira VOL. Devo parar de fazer isso?? Você pode sim fazer isso. 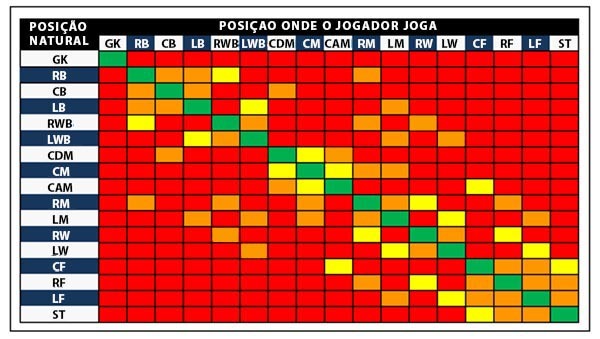 O que eu sugiro é que não olhe para os ratings dos jogadores em cada posição. No caso vc diz que a química de um LW que joga de CAM é reduzida..
Mas isso acontece só se eu escalar o LW de CAM na tela do Elenco, ou também acontece se eu só mudar ele de posição na hora do jogo, com táticas personalizadas? Supostamente a química não muda depois de iniciado o jogo, pelo que pode fazer isso. Are the players from the reserve playing with 5 chemistry? All players who get in during the game, do it with individual chemistry 5.